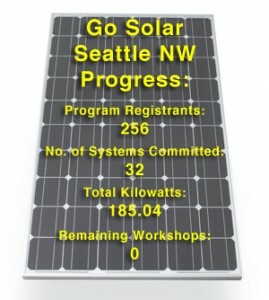 Community Energy Solutions, a 501(c) (3) organization, led the Go Solar Seattle Northwest campaign. Together with Sustainable Ballard, they let people know the benefits of solar energy through free informational workshops. 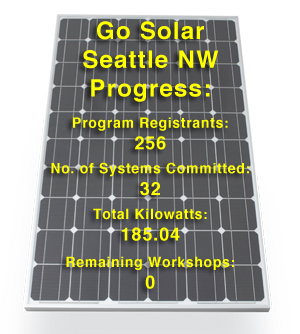 Go Solar Seattle Northwest is the most successful Go Solar Washington campaign to date with 50 new systems and 268 kilowatts of solar installed. This campaign also raised $10,101 to help those affected by Superstorm Sandy. The money was donated to the American Red Cross to help people affected by the storm. The Go Solar campaign was just beginning when the devastating storm made landfall on the east coast. To answer the call for help, a Solar Relief Fund was created. 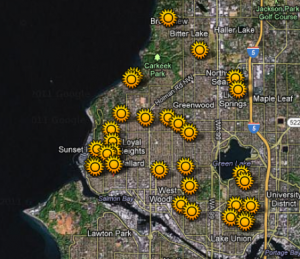 By the end of December 2012, eighteen families in the Seattle Northwest area and several non-campaign area families decided to go solar. This meant not only would they soon be using clean renewable energy and cutting their carbon footprint, but a portion of the funds were donated to help those affected by Sandy. Financial support came through donations provided by Sunergy Systems, the campaign’s Ballard-based solar contractor, and several major solar component manufacturers in Washington, Oregon and California. Tammy Deets of Community Energy Solutions, the non-profit organization leading the Go Solar Seattle Northwest campaign, said they are overwhelmed by the generosity and compassion of these leaders in the solar industry who donated funds for every family that went solar through the Seattle Northwest campaign by December 31. Ann Bodden, Major Gifts Associate for the American Red Cross Serving King & Kitsap Counties, said the Go Solar Northwest initiative was the only solar-tied fundraiser in this region. “It is wonderful to have a partner in the clean energy industry to raise funds for disaster relief,” she said. For the people at employee-owned Sunergy Systems, Sandy’s effects were personal. Sunergy Solar Consultant Chris Herman, a FEMA Reservist for twenty one years, spent thirty days in New Jersey, putting in ten to eleven hours a day helping Sandy survivors. 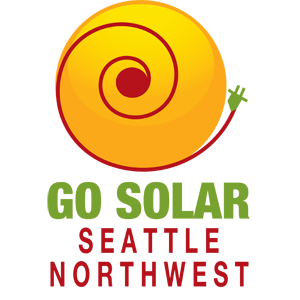 Others at Sunergy have immediate friends and relatives greatly impacted by the storm. Sunergy President Howard Lamb said, “The stories of loss and hardship have impacted us deeply, and realizing there are thousands of people who are experiencing the same or worse, we just had to step up,” he said. “We are proud of the work we do in solar and glad we can do even more. Community Energy Solutions is a not-for-profit organization that brings clean energy solutions to Main Street. Its recent efforts have led to the installation of over ninety solar energy systems, comprising over four hundred kilowatts of installed capacity on homes and businesses in Washington State. It also led the effort to create the first Community Solar Project on Bainbridge Island, a 71.3 kilowatt system on the City Hall building.